The clothes hanger organiser is great for storage or for use as a drying hanger. How come? Lets get weird and take a tour. Look up top, there`s a swivel hook. hang clothes sideways in your cupboard or facing you. Beneath that the clothes hanger has a button. Press that button and it folds up. 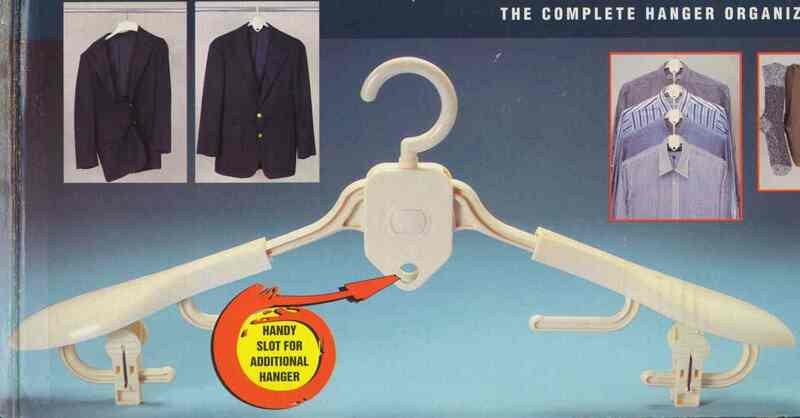 No more struggling to get a hanger out, it just slips through the neck hole. Plus just think if you are touring properly how neat it would be if it folded. There are pads where your garments shoulders normally get ruined, and you can slide them up and down, so your jacket or jumper is accommodated. Moving on down and there are little arms. And the point of those little arms? Clip. The clothes hanger organiser becomes a trouser hanger. Clip. skirt holder. Clip. Drying tool. As the clips are loose you can move them, wide apart for wide garments, narrow for narrow items. Like the extra sock or towel holder fittings. Hold those socks together (through the wash as well as on the hanger if you like) Hold those towels and hang them anywhere. Hang it all, this is a gripping tour. Moving on down, the clothes hanger organiser can hook into its self. That means you can store several garments, hanging one of these onto another to save space in your wardrobe or when travelling. And yes, the hangers are durable and strong enough to do this. So to end the tour: need to hold things on a dryer., or store them with a versatile closet organiser? InstaHanger Dream Catchers (30 cm hanger panel.). Clothes Hanger Organiser text, images and video are copyright.